More Than 50% Patent Landscape Analysis Are A Waste of Money! The consumers of landscape studies are broad, ranging from business executives to university management, and from IP counsels to R&D teams. Further, they all have their own set of requirements. A business executive, for example, will get a landscape analysis conducted for making a business decision – the potential market for a product, revenue expansion, etc., and an R&D team for research & development opportunities – technology alternatives, etc. A patent landscape helps a consumer achieve his goals – get solutions or draw actionable insights – which is its purpose too. To achieve such a purpose, a unique output needs to be crafted based on a consumer’s requirements. Because the saying ‘One size doesn’t fit all’, holds true for a patent landscape analysis as well. On the contrary, a majority of analyses are conducted without having the consumer’s goal and work area in mind. As a result, the end user fails to draw any insights and the analysis fails to achieve its purpose. After spending many years in the industry, delivering hundreds of landscape studies and studying nearly a thousand conducted by our peers across the IP industry, we found that more than 50% of the patent landscapes fail to help the consumer in any way. More than 50% of the patent landscapes fail to help the consumer in any way. This, however, can be changed by laser focusing on a consumer’s goal during all the stages of an analysis. The technology needs to be grasped and researched to meet consumer’s goals. Not only this but technology categorization, patent bucketing, the type of information to be captured and the insights of the analysis, all should be derived by keeping the end objective as a base. Consider a scenario where a business executive and an R&D guy are getting a landscape study on the same technological area. Here, the former wants insights to make better business decisions while the latter wants in-depth technical insights. Will the same analysis work for both of them? A business person may want to know “how he can expand his business?” and from the analysis, he gets “hybrid organic-inorganic lead or tin halide-based Perovskite material is used the most for developing new generation solar cells”. Undoubtedly, his reaction will be like that of Mark Wahlberg below. To make it more apparent, let’s consider an exemplary taxonomy (a hierarchical representation of technology) for ‘drilling in oil and gas sector’. 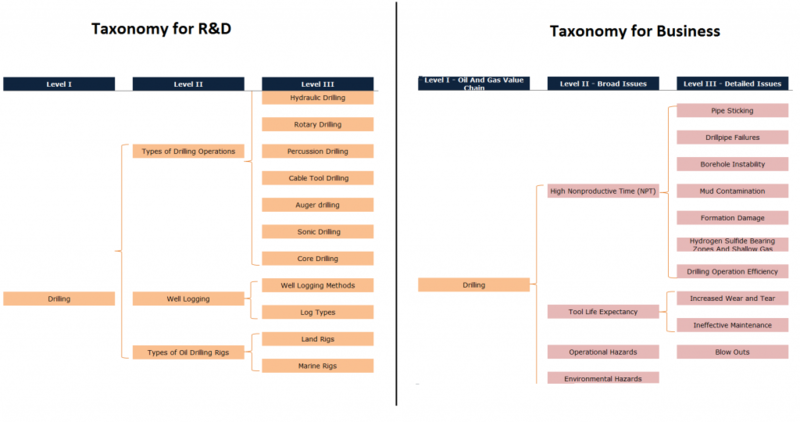 These taxonomies are drafted keeping two different types of consumers in mind – Business executives and R&D team. In the business perspective taxonomy, challenges in the domain are highlighted. This is done because there are fair chances of a business executive being not aware of technical peculiarities of the oil and gas sector. Further, considering his work area, we believe the taxonomy above can better answer what the business executive might be looking for. The level II nodes of the taxonomy (viz. non-productive time, tool life expectancy, operational hazards, and environmental hazards) address problems faced in the drilling industry. Including these in a landscape helps a business executive craft better and appropriate solutions for business development/expansion. Further, he can make decisions on the basis of how a particular challenge is going to affect the business goals of his organization and revenue targets. The R&D guy, as I pointed above also, is looking for in-depth technological insights. He wants to find better technology alternatives or breakthroughs in oil and gas field. Hence, he would prefer minute details of components, compositions, techniques, processes, alternative technologies, etc. These two taxonomies represent the same tech domain, however, are as different as chalk and cheese. This also answers the question: Will same landscape analysis work for both? Because their areas of operation/expertise are different, so should be the analysis and ways of conducting the analysis. If you are a consumer, you have to decide what you want from a landscape analysis to extract maximum value out of it. If that’s not happening, you are wasting your money, and no matter at what position you work, you are responsible for that wastage. When the industry is still struggling with ‘One size fits all’ syndrome, it’s you who is in the charge to decide the best output for yourself. Also, if an approach is not unique, will its output be useful? I don’t think so! What do you think? Authored By: Shikhar Sahni, AVP, Operations and Abhishek Bhatia, Team Lead, Concept Hackers.